It was 2-0 evening at Patong Muay Thai stadium on February 23, 2009 as Tiger Muay Thai and MMA training camp fighters scored 2 knock-outs. Laura scored a 2nd round KO of veteran Namfon and David (U.K.) knocked out foreign fighter, Aiden, from Turkey. Laura was returning from an injury and got back on track with excellent boxing skills and clinch to take out Namfon in the 2nd round. 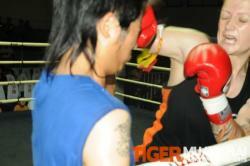 Dave, took on a Tae Kwon Do black Belt from Turkey and scored a 2nd round KO in his first Muay Thai fight. Using strong clinch and powerful hands to down his opponent 3 times and finish him in the 2nd round.